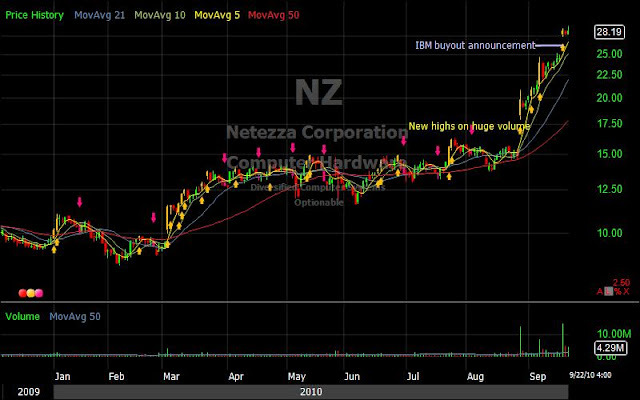 Netezza announced earnings of 0.09 versus First call consenses of 0.06 with an earnings surprise of 50% on August 26, 2010. This was the second surprise in a row with their previous quarter EPS change at 167% and Sales change of 28%. They also raised guidance about 20% higher. The stock was coming off several months of sideways churning action and just touched the 50 day MA prior to the day of earnings. With the highest volume in the past year, this was a great setup...I didn't take this one do to general market conditions. No Response to "Earnings Example - Netezza Corporation (Public, NYSE:NZ)"